6moons industry features: The Perfect Source? • A chair that you could easily sit in for hours, with great ergonomics and support for the body, back and neck. • … with a headrest that won’t block out the sound. • … have a place to put the remote controls within easy reach. 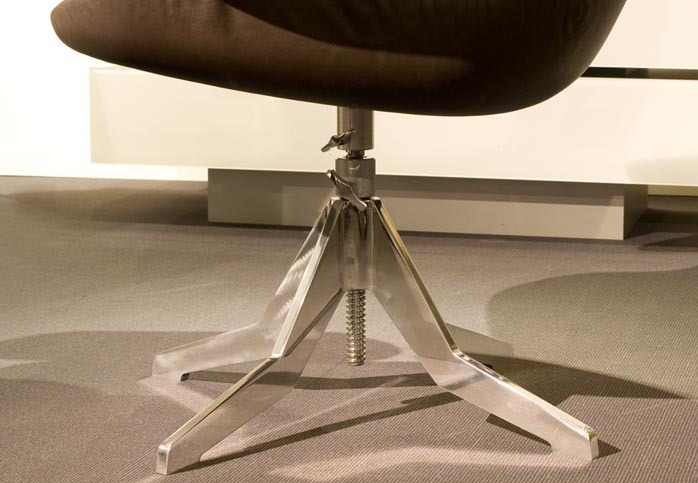 • for the really serious listeners, the ability to isolate the chair even more from the vibrations passed on through the floor. And of such beautiful design to take a "first row seat" in front of the soundstage. 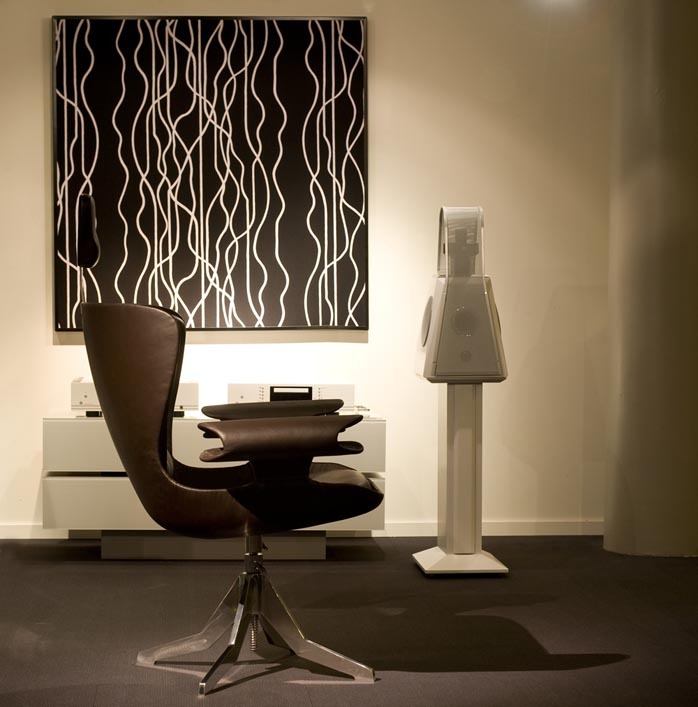 "The Ballerina Sweetspot listening chair is the result of a true collaboration of function and form, of a passionate audiophile and a talented and dedicated designer. And it all started in PowerPoint. 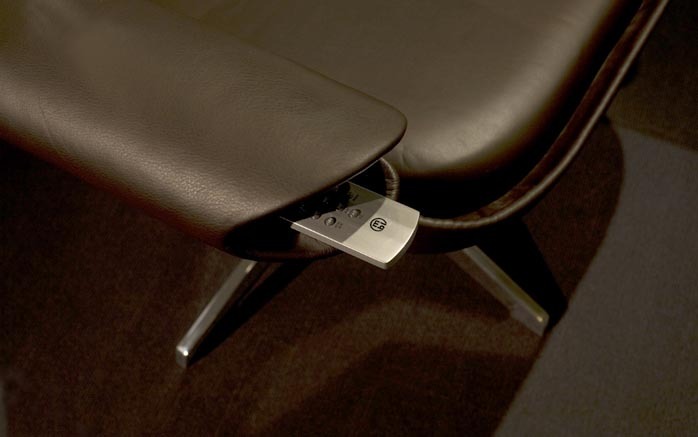 The first idea going into the design was actually the curved (and hollow) arm rests. I wanted something elongated that could hold the remote controls so you—or I—wouldn’t need to sit with them in the lap on the floor or away on a coffee table", said Michael Hollesen. "Also, often I had gotten up from the sofa after sitting too long only to have a hurting neck so I wanted a small headrest to provide support but also one that didn’t block the sound. 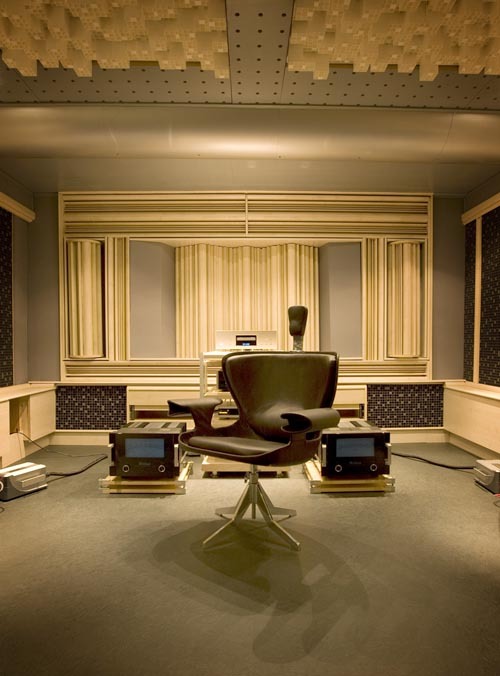 Most chairs with headrests today—even the great classics—cover too much of the head and ear, thus interfering with the sound. "The initial design that came out of these needs in combination with my own and PowerPoint’s limited design abilities resembled that of a ballerina lifting her ballet skirt and slightly neighing. 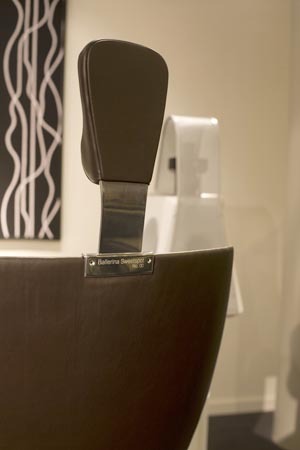 As it was a chair designed for listening to music in, the name was also born." To take another person’s idea —even a simplistic design— and enhance and develop it into a 'real' design requires both respect of the original thought, great skill and a large degree of own vision for the project. Jonas Rylander was the perfect choice to take the design further. "As a designer it is seldom that you get both such a narrow and detailed brief but also such a great degree of artistic freedom," starts Jonas Rylander. "It presented two routes. One was perhaps more futuristic in its design whereas the other was more contemporary and organic. In this chosen route, I had shrunk the original headrest in width, the chair had grown in size—and I had lowered the seating height and lower back—but also increased the curvature of the back to create a sense of being enveloped. Also I had chosen to create very distinct shapes of the cushions to further enhance the organic feel to the design. The result was a design with a large degree of male strength and hardness yet entirely female in its curves." 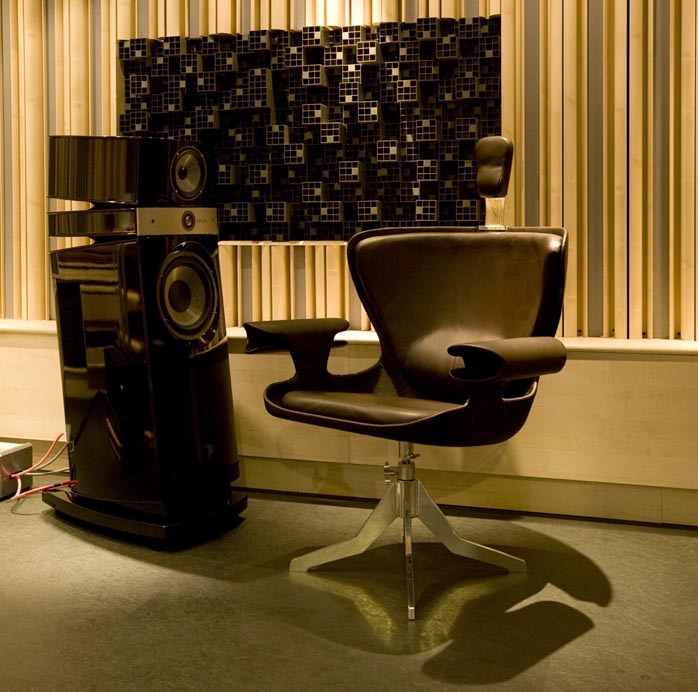 The Ballerina Sweetspot prototype is on permanent display at Audio Concept in Stockholm Sweden. The chair is planned to go into production in late January/early February 2010. 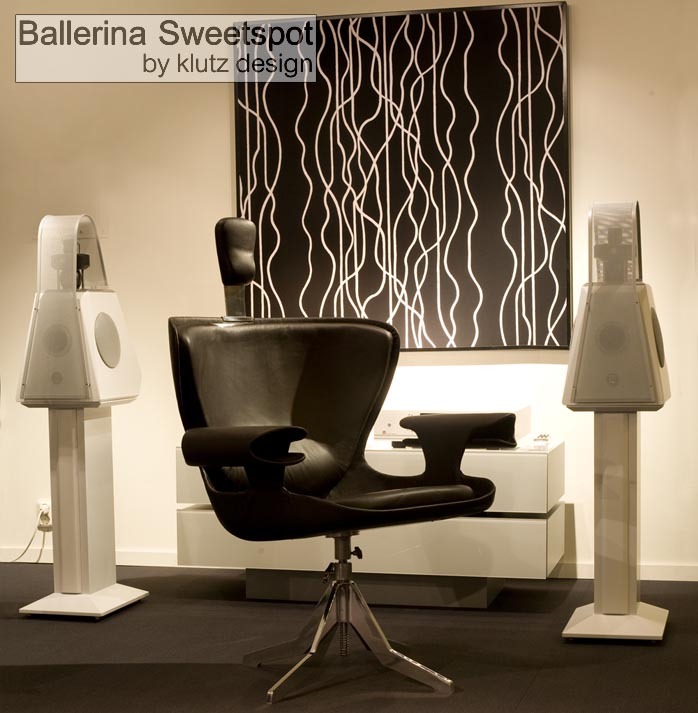 For the latest information on the Ballerina Sweetspot prototype, please go to www.klutzdesign.com or contact Michael Hollesen. Klutz Design Company was founded in 2009 by Cecilia Lütz and Michael Hollesen. None of the founders are designers by education or profession - but by passion. "The statement of purpose of Klutz Design is to make the products that we felt were missing in our lives. The only thing that these products have in common are unique functional benefits, a holistic, simple design and outstanding quality - products that we haven't seen elsewhere. That's what we call opportunities of function." About Jonas Rylander: Jonas is himself a music lover and an accomplished designer who got his education from the Swedish School of Design and Crafts at Gothenburg University. Apart from his own designs, Jonas has also worked on a project with Volvo, Electrolux and Tiger of Sweden.